Noted for her “glowing” and “sumptuous” voice, soprano Melissa Primavera has become a favorite with audiences. Of her performance as Antonia in Tales of Hoffmann Michael Caruso wrote, “She sang with dramatic intensity, impassioned lyricism and touching intimacy.” Her June 2014 performance of Clotilde in Norma at St. Petersburg Opera Company was hailed by the Tampa Bay Times as “excellent.” Melissa’s operatic repertoire includes Magda in La Rondine, Frasquita in Carmen, Nannetta in Falstaff, Monica in The Medium and Constance in Dialogues of the Carmelites. 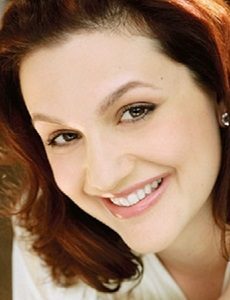 She has also delighted audiences with her comedic portrayals of Susanna in The Marriage of Figaro, Despina in Cosi fan Tutte, and Adele in Die Fledermaus. As a member of St. Petersburg Opera’s 2013 Emerging Artists Program, Melissa covered the role of Echo in Ariadne auf Naxos. Fluent in German, Melissa has been heard in concert in Austria and with Elysium Between Two Continents in Germany. She was a finalist in the 2015 Elaine Malbin Vocal Competition and a two-time winner of the Bronx Council on the Arts BRIO Grant (2013 & 2009). She returns to St. Petersburg Opera Company this season covering the role of Musetta in La Boheme.